Samsung is set to unveil the follow-up to its multi-million selling Galaxy S3 this week, as its rivalry with Apple gets set to hit new heights. The eagerly-awaited Galaxy S4 has quite a billing to live up to – its predecessor sold some 40 million units around the world and helped to cement Samsung’s reputation as one of the truly major players in the global smartphone market. While Samsung has been keen to keep details under wraps prior to the big launch, there are a few things we can be reasonably sure about when it comes to the latest addition to the Galaxy family. Firstly, the S4 – like its predecessor – is expected to run on Android, although it’s expected to have a significantly modified version of the operating system to set it apart from other Android-powered phones. Samsung is understood to be looking at boosting brand loyalty – something Apple has already managed with considerable aplomb – and distinguishing the S4 from the rest of the pack of Android devices is thought to be a crucial part of its strategy. In addition, Samsung is also reportedly looking at ways to make more money from app sales – potentially by launching its own app store, thereby cutting out the middleman, which in this case is Google. One potentially exciting aspect is the new eye-tracking capability which the S4 is rumoured to have. The New York Times reported recently that Samsung had filed for trademarks under the names “Eye Scroll” and “Eye Pause”, prompting speculation that the new phone will include software which tracks where users are looking and scrolling down the page automatically as they read. As Galaxy S3 users will already know, that phone’s Smart Stay function prevents the screen from dimming whenever someone is looking at it – so eye-tracking technology would seem to be a logical progression. What are you expecting from the Galaxy S4? Are you a Samsung or Apple fan – or neither? Let us know by posting a comment below. 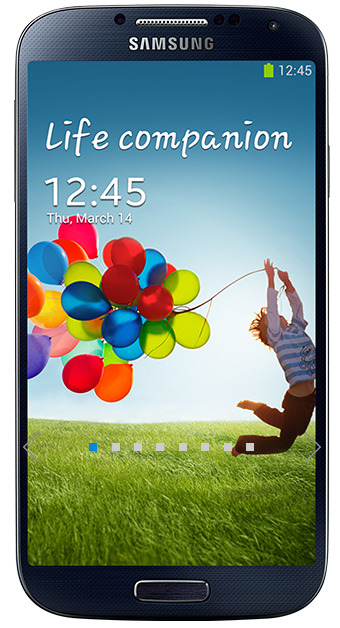 Update: Samsung has now unveiled the Galaxy S4. Most of the rumours have turned out to be true, with the 5″ screen and evolutionary (rather than revolutionary) design update arriving as expected, although the auto-scrolling eye tracking isn’t quite as awesome as many had hoped. You can read more about it at Engadget’s excellent preview.